Looking for Different yet Sensible. This V-Nose plan offers Great Towability plus the Extra Space in the Nose is well used with the Conveniently Located Kitchen. With the Slide in the Trailer can be Fully Accessed "One way or the Other" via the 2 Entrance Doors. Dry Weight Starting at 6392 LBS. Super Layout with 2 Slideouts Decorated in Luxurious Aurora Decor, Dual Pane Windows, 12 Volt Heated Tanks, Enclosed Underbelly, 21 Ft Power Awning with LED Lightstrip, Upgraded 15000 BTU Ducted A/C, High Gloss TPO Pre-Coloured Nose Cap, Oyster Exterior with Colour Keyed Roof, MaxxAir Fan with Roof Cover, Solid Surface Kitchen Counter, 2 Door Fridge, Stove with Oven, Microwave, Booth Dinette Sleeper by Window, Sofa with Trifold Sleeper, LED TV, AM/FM/DVD, Exterior Speakers, Separate Bathroom, Corner Shower, Serta Queen Walkaround Bed, Front and Rear Stabilizer Jacks, Gas/Elec HW Tank with DSI, Black Tank Flush, Torflex EZ Lube Axles, Polished Alloy Wheels, Backup Camera Prep, Solar Prep to Front Lower Corner, Spare Tire, Exterior RVQ. Check out our terrific lineup of new Trailers, 5th Wheels and Motorhomes for the 2019 season. Our friendly and courteous sales consultants are more than willing to showcase these beautiful RVâ€™s as well as demonstrate the many great features and options that may be right for you! 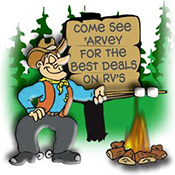 Please let us assist you in owning one of our RVâ€™s that suits your needs.